2) Healthy Scotties, Healthy Moms. Hoomans should take 10,000 steps a day. Go with them, Scots! We'll not only become healthier as a breed but have the healthiest moms as well! 3) New Adventures. 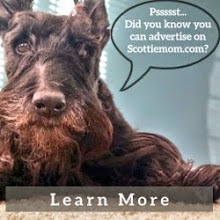 Scotties everywhere should challenge their hoomans to try a new things with them and share their experiences with other Scottie Moms so they can try it, too. 4) Scottie Tales. Scottie Moms around the world can unite this year through story telling to promote responsible Scottie ownership. 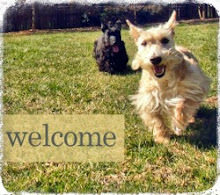 Share your Scottie's tale via our facebook page. You never know who might get featured on the blog! 5) Scotties as Social Media Moguls. Scotties may not be the most common household pet but that doesn't mean they can't be the most popular on the web. Mr. K predicts the Internet pet sensation of 2013 will be a Scottie sensation! Flash your pearly whites for the camera, Scots! I am doing my part..I changed both of my profile pictures to my scotties. Katie and Fiona's mum. When Kenzie the Westie was around, peeps would ask, "Are those two Scotties?". Around here there are more Westies than Scots but Scots seems to be more recognizable to the public. All the more reason to make this the year of the Scottie! Miss Heather does not often get recognized as a Scottie either but with some public education and cute, memorable photos, the recognition will come in time! We think this is a great initiative - like Dougall we are often mistaken for Westies which annoys mom and dad more than us. I guess I should have said on my facebook page where I am listed as Linda Hoffman Vaughn... I am enjoying your facebook posts.. that ultimately lead to this blog. Rock on Mr. K! Maggie and I are behind you 100%. Wheaten Scotties are beautiful, the dog world needs to learn more about them. When I attended Westminster years ago, there was nary a Wheaten or Brindle to be found, all blacks and black-brindles. Its been like that for a few years that I know of...does anyone know why? "Captain Gordon Murray and S.E. Shirley were responsible for setting the type in 1879. Shortly afterwards, in 1879, Scotties were for the first time exhibited at Alexander Palace in England, while the following year they began to be classified in much the same way as is done today. The first written standard of the breed was drafted by J.B. Morrison and D.J. Thomson Gray and appeared in Vero Shaw's Illustrated Book of The Dog, published in 1880; it was extremely influential in setting both breed type and name. The standard described the breed's colouring as "Grey, Grizzle or Brindle", as the typically Black colouring of Scotties did not become fashionable or favoured until the 20th century." Stamm, Miriam; Beauchamp, Rick (1998). An Owner's Guide to Scottish Terriers. TFH Publications. ISBN 978-0-7938-2786-2.